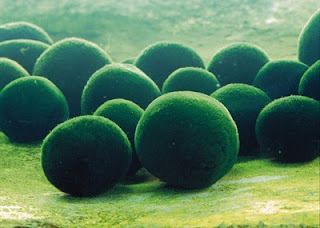 A Rinkya Blog: What is Marimo? 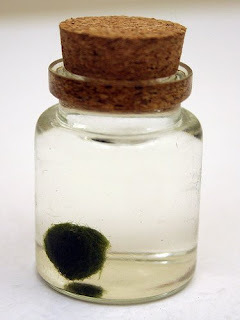 Marimo is a green algae that has formed into a perfect ball shape. Only found in Japan and a few European countries, it is now protected under law after having been ravaged by tourists and others trying to bring home the unique spherical algae. You can purchase marimo for your aquariums, they grow at a very slow rate, approximately 5mms per year and can grow to 20-30 cms (up to 12 inches)! Therefore, large ones are much more expensive, as they are much older. They are more often sold as seen above, in small glass jars. Every October, the Marimo Festival is held at Laka Akan in Hokkaido (home to some of the largest marimo in the world). 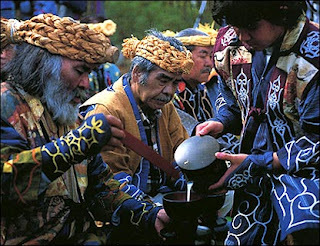 The local Ainu people extract a marimo from the lake and return it to its' home on the third (and last) day of the festival. Fireworks, dancing and other rituals take place during the festival, meant to celebrate nature and the preservation of Marimos. Pictured above is the offering of rice wine to the gods. 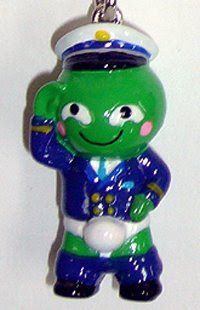 As usual with most popular things in Japan, Marimo is also a very cute mascot. There are many different stuffed toys, phone straps, available. 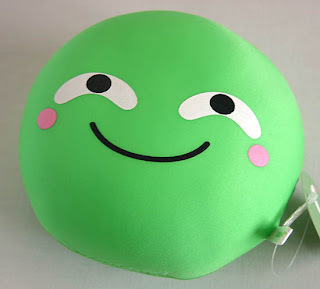 Marimo pillow pictured above, avaiable on auction here! And there you have it, more than you ever wanted to know about Marimo!